Writer Adept: Khans of Tarkir: Could It Be Common? Another spoiler season for a new set, another set of unofficial spoilers, this time courtesy of MTGSalvation. 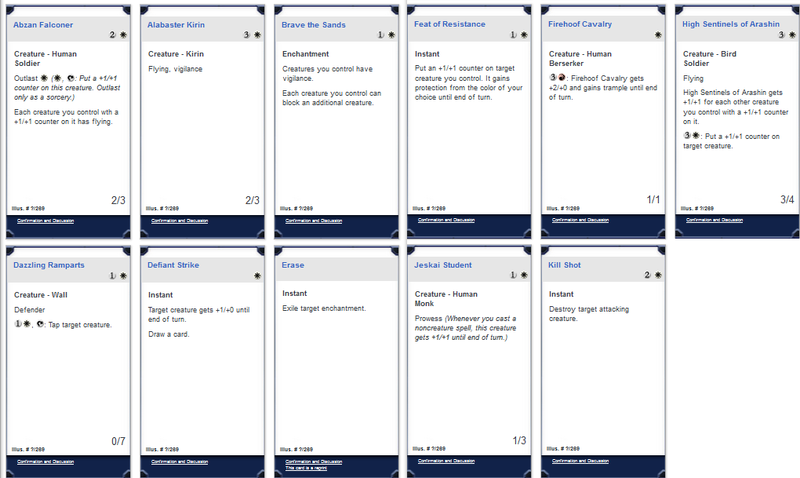 In this case user nal2 posted the text of a bunch of cards from Khans of Tarkir, without artwork or even the rarity. As I was perusing the spoiled cards, I found myself trying to figure out which ones could be Common. It was such an interesting exercise, I thought I would post it up here on the blog for my readers. But rather than focusing on all of them, I decided to limit it to White. Based on what we know about Common Design, can you pick out which of these cards are Common? Actually, I would divide them into three categories, based on the fact that sometimes rarity is determined by factors other than power level or complexity. I've recorded my picks, and I will discuss them on Saturday. Let me know your picks in the comments below. Once these eleven cards are spoiled, I'll even throw in a small prize for whoever gets them all correct (or randomly select one among multiple winners). Full spoiler is out. Chris got it exactly. I'll have a writeup tomorrow as promised. Erase really surprises me. Deicide is rare and Revoke Existence is common, but 2cmc at sorcery speed. They really pushed this one. Oh, I get it. It's a reprint.